Mon to Sat: 6.00 to 7.00 p.m. Coaches: Patric & Gaurang Sir. Tues, Thurs: 7.00 to 8.00 a.m. , 8.00 to 9.00 a.m.
5.00 to 6.30 p.m. , 6.00 to 7.00 p.m. Sat, Sun: 4.00 to 5.00 p.m. , 5.00 to 6.00 p.m.
Tues, Thurs: 7.30 to 8.30 a.m.
Tues, Wed, Fri: 5.00 to 7.00 p.m. 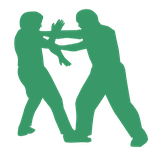 Learn krav-maga self-defense which is a practical and tactical system which teaches how to prevent, deal and overcome all kinds of violence and attacks. Timings: Monday, Wednesday, and Friday at 6.30 am and 6:00 pm.